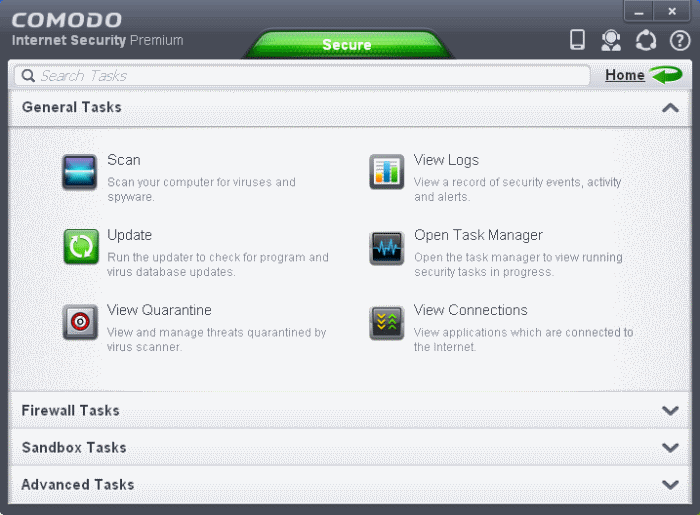 The links in the 'Tasks' interface allows you to configure every aspect of Comodo Internet security. General Tasks - Run antivirus scans, update virus database, view and manage quarantined threats, view logs of security events, activity and alerts and view running security tasks. Refer to the section General Tasks for more details. Firewall Tasks - Allow or block applications, manage ports, manage networks and configure advanced firewall settings. Refer to the section Firewall Tasks for more details. Sandbox Tasks - Run applications in a virtual environment and configure advanced sandbox settings. Refer to the section 'Sandbox Tasks' for more details. Advanced Tasks - Create a boot disk to clean up highly infected systems; install other Comodo software like KillSwitch and Cleaning Essentials; submit files to Comodo for analysis and gain access to the 'Advanced Settings' interface. Refer to the section Advanced Tasks for more details.